TVHS alumni sit on a panel to discuss their time at the school as well as what they’ve been doing since graduation with current students. On Friday, January 4, current students got a glimpse into the future at the annual TVHS Alumni Day. 30 graduates came back to the school to share with current students about their experiences in high school and offered insight about what helped them prepare for college and what they wish they had done differently. This year, representatives stretched all the way back to 2012, the second graduating class ever from TVHS, and ranged all the way up to the class of 2018. Graduates shared stories of their successes in college and securing a job in their chosen field, and how Tech Valley prepared them for the challenges of both. “I didn’t realize how much we learned here until I saw someone who didn’t go here try to give a presentation,” said Ben Mattice (TVHS Class of 2016). “It was helpful to be able to hear the struggles of college and work, and to hear about how each individual dealt with those struggles was insightful. It was cool listening to the stories of the alumni. I was the most excited to hear from alums who have entered the workforce and how TVHS helped them to succeed in the real world,” said TVHS Sophomore Amanda Thrasher. 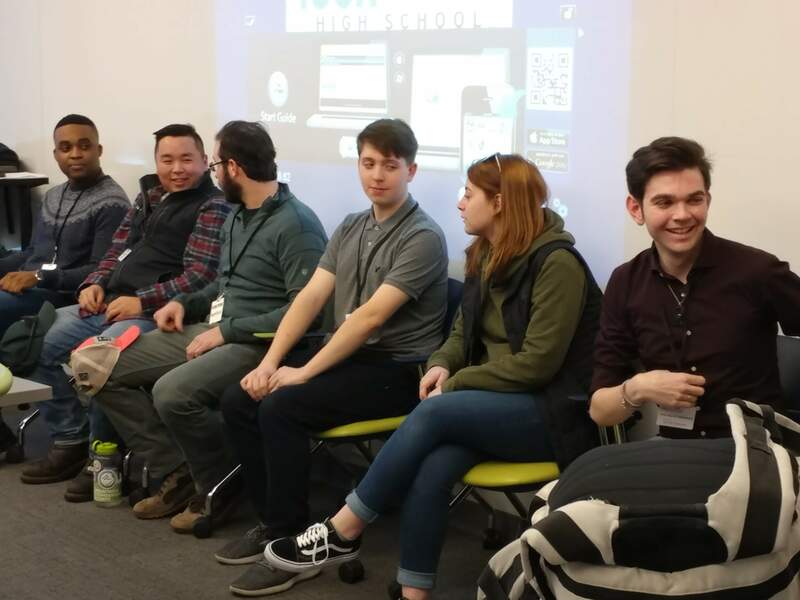 Alumni offered advice to current students as well, especially in the areas of making connections and keeping your options open. “You don’t have to be dead set on something when you leave high school, or you could just be lost. I went to Hudson Valley for 2-3 semesters for Architecture, and as I got to the end of it, I realized I didn’t want to do it anymore, so I switched to construction management and I’m starting that next semester. It’s not a bad idea to get a lower degree then move on and get a higher degree,” said Brandon Goddeau (TVHS Class of 2017). 2018 TVHS graduate Bennett Plowman encouraged students to seize the opportunities they have at Tech Valley and shared how his I-Term experience helped him land an internship after graduation. “Through the whole event, the one thing that stuck with me is that every path is not straight. Everyone will have a bump in the road or a detour to go through, but it’s your job to stay on and continue. Because if you do stay on for the ride, the end result may surprise you,” said senior Nikki Begum. English teacher Lana Hower coordinated this year’s Alumni Day and said while it’s a good way for alumni to help current students succeed, the connections is fosters are also important. “Alumni Day is a great way to keep the Tech Valley community connected and continue our commitment to giving back to our community. It is wonderful to see our students all grown up and healthy, successful young adults who were well prepared for the worlds they entered,” said Hower.